"We had a great run, for several years DirectEve has been a huge player in the EVE Online automation community. But every great beginning has an end. We no longer have any developers actively supporting the project, so its time to open the source. I seriously do not get why you were never able to stop this bot. It's not exactly hard For your next MMO, consider consulting bot builders about anti hacking mechanisms." Also on Friday, Questor developer ferox2552, who developed a fork of the Questor bot that did not require Inner Space to run, published one word in his development thread: "Discontinued." In mid-October, ferox2552 had posted that he lost his latest copy of the source code which contained critical fixes and then went silent until his "Discontinued" post. From the posts I've read, the available ferox line does not work at all and the Questor versions that do work use Inner Space and are a bit wonky and require human attention. In short, except for a few programmers who understand the code, Questor is dying. Unless someone is able to come in and maintain the DirectEVE code, Questor will die a slow, lingering death. For years, Questor was one of the best, if not the best, botting programs running in EVE. Seeing it finally fade away is a bit of good news in CCP's War on Bots. But the software has looked like it was dying in the past. Hopefully this time, Questor will not rise from its deathbed. Yesterday, CCP Falcon posted some information on the EVE Online forums that affects multiboxers in general and users of the multiboxing software ISBoxer in particular. First, he introduced three terms that will play an important role is defining a bannable offense. The rankings of the top twelve MMORPGs as determined by the players of the Xfire community from play on Sunday, 23 November 2014. For more details about the methodology, click here. Historical data can be found here. Sunday saw a contraction in the amount of time Xfire players spend logged into their favorite MMORPGs. The 15.6% reduction in the amount of hours the Xfire community recorded was led by World of Warcraft (-4656 hours) while ArcheAge (+293 hours) rebounded strongly. Both Elder Scrolls Online and APB:Reloaded fell out of the list, replaced by Planetside 2 and Neverwinter. Technical Difficulties Fixed? Sunday saw a 22% decline in the number of hours recorded by Xfire members playing World of Warcraft. But did that mean players soured so quickly on the latest expansion, Warlords of Draenor? I don't think so. The hours recorded includes time spent waiting in the login queue. The problems during launch week were so bad that Blizzard is giving players 5 days of extra subscription time as compensation for all the problems. As an indication of the improvement in the technical aspects, the average time a Xfire member spent in the game Sunday from from 8.5 hours down to 6.6 hours. Exploits? I wonder if the recent duping exploit involving APEX purchases had anything to do with the 26.6% increase in the hours Xfire members spent in ArcheAge on Sunday. The average time players spent in the game was 7.8 hours. The use of APEX is now disabled as Trion and XL Games try to fix the issue. An Anniversary - Planetside 2 celebrated two years of operations on the 20th with a double XP weekend. In addition, SOE offered a bundle of in-game items, usually a $179.50 value, for only $39.95. The celebration returned PS2 to The Digital Dozen for the first time in six weeks. I originally intended to publish a bittervet tinged post today, but something amazing emerged from EVE Down Under Friday. CCP's latest video, "This Is EVE", debuted in Sydney and already has over 1.2 million views in less than 72 hours. Not only did the video spread quickly onto gaming sites like Massively and PC Gamer, but new players started to flood into New Eden, curious about the game. Once people started noticing, everyone, CCP and players alike, leapt into action. CCP held another series of new player training sessions on Saturday from 1600-2100 EVE time covering "Orientation and the UI", "Skills", and "Ships and Fittings". EVE University, in an event publicized on the EVE launcher, followed up with a super lecture session running from 2100 EVE to 0745 EVE time on the 24th featuring a roam FC'd by Pandemic Legion's Apothne. Having Apothne, a commentator for Alliance Tournament XII, FC a fleet was a good move as it showed that a new player can get into a fleet like those shown in the trailer. Another hopeful sign were the reports of Brave Newbies visiting the new player systems looking for recruits. Since Brave Newbies was mentioned in the trailer, the new players enticed into EVE were probably excited that they would get a chance to experience what they saw in the trailer right away. I also heard reports of veteran players starting up alt accounts to join the Rookie Chat Channel to answer questions. On the CSM front, I know that CCP Manifest performed some dev magic to allow Sugar Kyle into the rookie chat channel on her main on Saturday and that Steve Ronuken and I believe Mike Azariah spent considerable time helping new players over the weekend (I'm sure I'll hear if I left anyone out). By Sunday, I heard that new players were sometimes getting answers from four players when they asked questions. People were popping up all over the place offering advice. CCP Manifest streamed a play through of the new player experience Saturday night/Sunday morning and such luminaries as video maker JonnyPew (Sir Livingston in the trailer), Ashterothi of the Hydrostatic Podcast, and Crossing Zebra's and EVE101.com's Hendrick Tallardar showed up to offer help. The EVE community has a reputation as a group that will scam and kill new players without a second thought. But EVE is a game that in many ways is owned by the players and the community wants to see the game grow and thrive. When an event occurs that brings a flood of new players into the game, whether it's a large battle like B-R5RB or a trailer like "This Is EVE", a large segment of the player base turns out to welcome the new players and try to help them overcome the game's steep learning curve. I've never really seen that in other games and is one of the things I think makes EVE Online a special game. I've seen a couple of things posted on Twitter that fit in with this post. First, Blackhuey created a Google document titled "Newbies Are Awesome 101 or: why people who say that newbies can't compete with vets in Eve Online are pants-on-head retarded." Well-known pirate, artist, and EVE blogger Rixx Javix tweeted the following video on what it is like to be an EVE player. I haven't written about the actions of Team Security for quite some time now. The team has quietly worked away in the background while other teams and game decisions start to play a larger role. Two events yesterday highlighted the change. The first was that the price of PLEX hit 1 billion ISK before settling down toward the 970 million ISK range. While players look at the price of PLEX skyrocketing, I see the price plummeting. The websites selling illicit ISK were already struggling when the price of ISK sold in Jita was $22 USD/billion ISK. Now that the price of ISK has sunk down to $18 USD/billion, I see only a handful of the sites I monitor trying to stay competitive with the CCP-sanctioned method of buying ISK. Needless to say, no more graphs about the website price of ISK. The data just isn't worthwhile. But at $18/billion, I'm interested to see how sellers without the infrastructure needs react. "To be clear upfront we do NOT believe this will, nor is this an attempt to, kill web sites like EVE Central. For one the format of this data is not very friendly for many applications. It is not the best optimized if you are trying to bulk get data for many different items from many different regions, and other such things. Web sites such as EVE Central and their APIs will be around for a long time to come. We are however fairly hopeful EVEMon can stop cache scraping after this." We will be incorporating the new CREST order endpoint for even higher quality data, when it becomes available! Does anyone really think a bot developer is going to register his/her bot with CCP? I don't think so. Hopefully, having to use authorized CREST will mean that only legitimate third party apps will access the real time data and not bots. That's the quick update for now. Unless Team Security comes out with a dev blog with lots of nice stats, I probably won't publish another update until next weekend. I have a lot of data to compile before I can really write another post on the subject. Yesterday, in the wake of the launch of the Warlords of Draenor expansion, Blizzard announced that World of Warcraft had once again surpassed the 10 million subscription mark. Last month, Blizzard announced that WoW "only" had 7.4 million subscriptions on 30 September, an increase of 800 thousand from the end of the second quarter. Basically, in six weeks, WoW increased its subscription numbers by at least 35%, or 2.6 million. Wow! That many gamers heading back to Azeroth has to have an effect on other games. According to the Xfire numbers gathered on Sunday, free-to-play games were hit much harder than subscription games. The only exception was Final Fantasy XIV, but that game is experiencing DDoS attacks, so the Square Enix product isn't as affected by the new expansion as a quick glance at the raw numbers may suggest. Of course, due to the decline in the Xfire community over the past two years, the Xfire numbers may not necessarily reflect reality. The only one of the top games that I know of that provides hard numbers is EVE Online. CCP launched its Phoebe patch for EVE on 4 November to glowing reviews. Yet, despite reports of increased combat, especially that involving capital-class ships by the smaller player organizations, the weekly average concurrent user number dropped 3.5%, from 26,513 down to 25,579. Still, that low of a drop was possibly caused by other factors like expiring offers, so I looked for some other data. The price of PLEX was very interesting. On 12 November, the day before the launch of Warlords of Draenor, the average price of a PLEX sold in EVE Online's main trade hub of Jita was 876,150,000 ISK. Yesterday, the price had risen 11.5% to 977,219.999.99 ISK. As a basis of comparison, from 30 September to 31 October, the price of PLEX only rose 7.4%. Interestingly enough, the volume traded Wednesday over Wednesday increased from 2,028 to 2,823, which usually indicates players coming back into EVE looking to subscribe using PLEX. But yet, the ACU fell. Another theory for the increase in the volume of PLEX traded is speculation. Due to the rapid increase in price, I expect the EVE Central Bank to conduct a market intervention soon. Yet, would the price have increased so quickly if players were spending their money on WoW instead of buying PLEX to convert to ISK? I'm not so sure. Of course, the numbers in EVE could just reinforce the fact that subscription games that have a solid IP and strong player groups like guilds, corporations, or free companies will stand up to the challenges provides by new games or expansion from the giant in the industry. I also think that explains why game studios still want to try to produce subscription and not free-to-play games. The stability of the games is more dependent on the decisions made by the studios and less on outside forces. I think everyone wants to determine their own future. I like to think I know what's going on with CCP's development around EVE Online. Yeah, right. I got schooled a little today by UI developer extraordinaire, CCP Karkur. She sent out a tweet yesterday featuring a screenshot of her flying a Thanatos in Thera. No, she wasn't using dev hacks; she has her own development server. Since she likes to debut new UI features with these types of tweets, I'll post the screenshot below and let you try to determine what she added. What did CCP Karkur Add? The rankings of the top twelve MMORPGs as determined by the players of the Xfire community from play on Sunday, 16 November 2014. For more details about the methodology, click here. Historical data can be found here. Sunday saw a huge increase in the amount of time Xfire players spent logged into their favorite MMORPGs. The 74.1% increase in hours played was led by World of Warcraft (+12,921 hours) while the game experiencing the biggest decrease was Guild Wars 2 (-364 hours). The Big Expansion - The 74.1% increase in the overall hours spent playing MMORPGs on Sunday was not caused by technical issues. World of Warcraft's latest expansion, Warlords of Draenor, launched last Thrusday. Despite launch issues like disconnection issues, extremely long login queues, and a DDoS attack at launch, the Xfire community still flocked to Azeroth to partake in the new content. However, I don't know if the Xfire client counts the time spent in queues toward the total played time. The average Xfire member spent 8.5 hours in the game Sunday. I expect the average to steadily decline over time. Faster Leveling - In a week dominated by WoW, I was surprised that Elder Scrolls Online returned to the Digital Dozen after an 8 week absence. I'm assuming the big percentage gain in time the Xfire community spent logged into the Zenimax product was due to a change in XP requirements that was introduced in patch 1.5.4. Not only was the XP required to gain a Veteran Rank reduced from 1,432,550 to 1,000,000, but Veteran characters will also see increased XP gains from killing monsters of up to 5 ranks lower than the player character. CCP Seagull dropped a little dev blog on Friday giving a brief overview of the changes coming to EVE Online with the Rhea release on 9 December. The buzz on Twitter was pretty positive. But I'm going to hold off writing about the changes for a couple of more days because I got busy doing some non-EVE video game things. No, I didn't jump into a new video game like ArcheAge and the Warlords of Draenor expansion did not draw me back into World of Warcraft. The first thing is a six-year-old Japanese RPG whose PC port was released on Steam last week, Valkyria Chronicles. The game takes place in a fictional Europe in the 1930s in a country based on the Netherlands. The game is divided into chapters, with a lot of cut scenes surrounding the one combat mission in each chapter. The story is a bit cheesy at times, but so far I like it. I think the anime art style and watercolor graphics helped the game age pretty well. More importantly, I like the turn-based combat in the game. The controls were a little strange, but then again, Valkyria Chronicles is a PC port. I should add that another reason I like the game is that it's hard. Perhaps I should refer to the game as a challenge, as I'm probably not that good at these types of games. I find myself needing two tries to clear any of the missions. Right now, I stalled on Chapter 5, as I'm trying to figure out the best way to take out a heavy tank. The second thing I did this weekend was by a Wii U. Why would a buy a console when I'm horrible at console games? Well, not because Super Mario 3D World and Nintendo Land came with the unit. I've got a personal goal I want to accomplish and don't want to wait until New Year's to start. Currently I'm about 8-10 pounds lighter than I was when I attended Fanfest in May, but I really need to lose more weight than that. The weather is getting really cold here in Chicago and gym memberships are expensive. So I figured that, since I'm so heavily involved playing video games anyway, I'd add the Wii Fit U Game to my list. I purchased the package that includes the Wii Fit Balance Board and Fit Meter and started using the Wii U Sunday. Setting up the console was really easy, which is always a concern I have. The synchronization function that connected all the peripherals like the Game Pad and Balance Board wirelessly worked the first time. In fact, I like the television controls on the Game Pad better than the remote control that came with my TV. Also, using the stylus with the Game Pad touch screen makes logging into the console and Nintendo's network so much easier than setting up on my PS3. Admittedly, I'm a natural skeptic. I've always wondered how well these types of games really do at helping people lose weight. So far, the signs are promising. The initial set-up for the program uses the balance board to weigh the player. The board came within a half pound of what my bathroom scale reads. Not bad. Then the game figured out my "Wii age." 57. Look, I'm old, but I'm not quite that old. Part of the incentive to keep playing now is to see if I can bring that number down. The game also forces the player to set a goal. I chose the modest, and thoroughly achievable goal of losing 12 pounds in 2 months. Sure, the holidays could get in the way, but at this point I'm pretty established in my diet and I'm counting on the additional exercise the Wii U will provide to see me though. I won't know if Wii U Fit really produces results for a couple of months, but while exercising, I noted three aspects of the game I particularly liked. First, the game monitors the player's form for some of the exercises and gives good feedback on how to perform the exercise better. The game also has a scoring system and leaderboard to show how a player performed to allow players to judge if they are progressing or slipping. Next, about 20 minutes into the session, the game gave me a gentle hint that I could stop. I like that the game has an algorithm to limit the length of a workout. People overdoing workouts can lead to people just stopping and giving up. However, I kept going because I was having fun. Yes, the most important aspect was that I was enjoying myself. I had set a goal of 30 minutes and I think the last mini-game I played was a cycling game. When I finished, a big banner displayed across the screen letting me know I had gone for 30 minutes. I also exceeded 100 calories burned. I was happy. My new found interest in Japanese RPGs and the Wii U doesn't mean I'm turning away from EVE. But who really wants to hear how I compiled 50,000 Sisters of EVE loyalty points this weekend in anticipation I may need to replace losses that occur in the new Sleeper exploration sites? Well, perhaps some might, but I didn't feel like writing that story. With the launch of Phoebe and the changes to long distance travel, the major null sec powers have reportedly built caches of capitals throughout their areas of influence. The logic makes sense. Put slow moving ships in areas where a corp or alliance wants to fly and move the pilots around in fast moving ships. Why not? I've basically done that for the past year or so. Currently I have two major bases of operation in low security space, although I've stopped mining from one due to the increased threat level of a PvP alliance moving into my home system. I really need to make a third due to the activities of one of my alts basically requiring a better ship to mine in than a Venture to supply ore for storyline missions. I have a Procurer I keep in a Giant Secure Container to move around for such occasions, but I'm getting lazy. Besides, with the Higgs Anchor pretty much a required rig now, I don't want to repackage ships. Those things are still expensive and I'm researching my BPO in order to mass produce them. Right now I'm trying to make my caches more than a mining barge, mining crystals, and a stock of ammunition for when my warships pay a visit. Ideally, I'd like each base to have a Procurer, Prospect, Cheetah, Hound, and Jaguar. I've had the Procurers purchased for some time because I know I will lose some. The Prospect is a nice ship to roam with and performs wonderfully in gas harvesting missions. The Cheetah and Hound are ships for Rosewalker to fly. The Hound provides needed DPS to clear out the big NPC ships in belts and I like the ability to swap to the Cheetah for exploration at a moments notice. I really do need to start running data and relic sites again. Finally, the Jaguar provides that needed tackle when Mordu's Legion shows up in the belts. I'm actually close to that goal now. I've researched the Prospect and Cheetah blueprints and hopefully will have some Hound and Jaguar BPCs finished on Saturday. I also have blueprints for most of the fittings. I just need to run some more Sisters missions to get the LP to buy more faction probe launchers and probes. But once I'm set up, I can either clone jump or move from place to place in my blockade runners. I'm looking forward to that day. Quite frankly, I'm getting lazy and am tired of moving ships around. Having a few caches of ships scattered around sounds like a good idea. Occasionally I'm reminded that I haven't fully adapted to the EVE Online universe. The latest example was a comment left on yesterday's post. I was reminded that a player does not have to die in order to lose skill points when losing a tech 3 strategic cruiser. Let me explain how my experience in other games led to this mistake. In EVE, a player isn't considered dead unless his pod is destroyed. The pod is the little green or gold spacecraft that actually contains the player's avatar. The player sits in the pod, which is inserted into a ship. In order to actually kill a player, the player must have two spacecraft destroyed, the main ship flown and the pod. Once the computer in the pod detects a hull breach, the player is killed by the pod and at the instant of death the contents of a person's brain are transmitted to a medical clone. So I guess technically according to the lore, no one ever actually kills another player. However, that seems a bit strange. Because I basically only use the hangar view and never enter the Captain's Quarters, I see the ship as an extension of myself. That's where my experience in other games kicks in. In WoW or EQ2, I wouldn't consider an attack on me as an attack on my armor and equipment. No, the enemy is attacking me, and a successful attack means I'm dead. But in EVE, the enemy basically attacks my armor and weapons before trying to kill me. Oftentimes the enemy is satisfied with destroying your ship. For example, NPCs ever try to kill a players pod. NPCs that don't try to kill you? Yes, EVE Online is a very strange game. What also leads to confusion is that when a player destroys another player's ship, a kill report, commonly referred to a kill mail, is sent to the victor. That game mechanic reinforces the thought that destroying another player's ship is killing the other player. Perhaps if the Incarna expansion had succeeded in bringing avatar play into EVE, I would not think of losing a ship as dying. Spending significant amount of time in an avatar outside my ship would decouple the thought that I am the ship. Until CCP builds in that gameplay (at this point highly unlikely), I'll just have to remember that losing my ship isn't really part of EVE's death penalty. ""We take quality of life in EVE seriously. And while many of these changes are made by individual developers who are responding to player requests, this is a fully supported direction for all of EVE development. So you can expect more of these kind of changes in the coming year, because we are questioning a lot of old truths and assumptions." Last Thursday on the o7 show, CCP revealed the elimination of the different levels of clones and the clone updating mechanic which required the payment of ISK to prevent the loss of skill points upon the death of a pod. In effect, CCP will reduce the death penalty in EVE Online in the Rhea release on 9 December. CCP Terminus gave three main reasons for the change. The first is that high clone costs are a disincentive for older players to take risks and "interact" with other players. The second is that many new players are affected because they don't know about the importance of upgrading skills (or that the mechanic exists at all) and negatively affected once they find out the hard way about the penalties of having an insufficient clone. Finally, CCP is looking to make additional changes in what clones are, how they work, and how skill points work in general. From the public statements available so far, the members of the Council of Stellar Management are not unanimous in their reaction to the change. Sion Kumitomo, in an article on TheMittani.com, came out strongly in favor of the changes. DJ FunkyBacon came out just as strongly opposed to the change on his EVE Radio show Friday night/Saturday morning. Mike Azariah, appearing on EVE Radio's GRN Show on Sunday, stated he opposed the complete removal of clone grades but favored a more change in clone costs that would not hit veteran players as hard as currently. And in her weekly CSM update, Sugar Kyle wrote that the removal of the mechanic was just the first step of the process; one she hopes results in the decoupling of implant clones and pods. As a low sec carebear who putters around Minmatar factional warfare space in a one-man corp avoiding PvP as best as I can, my opinion may not matter. Then again, when has that ever stopped me from posting? So here's my take on the upcoming clone changes in Rhea. Hopefully I have something new to add to the general discussion. The rankings of the top twelve MMORPGs as determined by the players of the Xfire community from play on Sunday, 9 November 2014. For more details about the methodology, click here. Historical data can be found here. The Xfire community didn't change the amount of time it spent playing the most popular MMORPGs this weekend. The 0.2% increase in hours played on Sunday compared to the week before was led by ArcheAge (+690 hours) while Star Wars: The Old Republic (-333 hours) experienced the biggest decline. Maple Story made its first appearance on the list since mid-June, replacing Neverwinter. Land Rush - Last week, ArcheAge's Aurora update launched on Tuesday in North America and Thursday in Europe. Despite disconnection issues at launch that affected guilds ability to grab land on the new continent, the game saw the Xfire community double the time spent logged into the Trion product Sunday compared to the weekend before. The Boost Is Over - This week saw Star Wars: The Old Republic fall back down to third on the list after a three-week run at number two. The effects of the 12.32 times experience boost offer for pre-purchasing the Shadow of Revan expansion and subscribing for 30 days is probably winding down for the first wave of people to participate. However, the offer does not expire until 1 December. No Convention Bump? - Last week, Blizzard held it's annual BlizzCon convention in Anaheim, California. Normally, I would expect World of Warcraft to get a bump in playtime from a successful event, but Sunday witnessed the Xfire community spend 2% less time logged into Azeroth. Reports are that WoW was not mentioned as much as Blizzard chose to spotlight its newest games and the new Overwatch IP. However, with Warlords of Draenor launching on Thursday, expect Xfire members to jump into the new content. For some reason people like reading about mining in low sec. I haven't written too much about the subject lately because following the changes to the Procurer in Kronos, I felt the rugged little mining barge with the big tank was kind of obsolete. So after a few close calls, I put the ship in the hanger and started training for the Prospect. Then a funny thing happened. I discovered mining missions. If I wanted to fly the Prospect, I figured I needed to do everything possible to squeeze mining yield from the hull. So while researching mining skill implants, I discovered that they were only found, at least locally, from the NPC mining corporations. Mining corporations, I discovered, only have level 4 agents that give out mining missions. But with Mining Connections V and faction standings of 9.9, the payouts aren't too bad for the ice mining and gas harvesting missions. I had a pretty good thing going. Because I was operating in mission space, I had plenty of warning of anyone trying to probe me down. I thought nothing could touch me as long as I paid attention. Then Mordu's Legion showed up. I am a believer in the new accelerated release cycle that CCP Seagull has instituted for EVE Online. I saw what a two week cycle did for Guild Wars 2 and knew that if CCP could implement good quality releases, then EVE would experience the same type of player retention and acquisition numbers. I spent some time last night compiling some numbers for a post I plan on writing in early December about the subject. But as I gathered the data, I thought a quick review of September and October might prove interesting. This morning I read an article on Massively about Aion's new expansion, Invasion. Among the features listed is a new system that rewards players for logging in every day. Of course, Aion is not the only game to do this. When I played Neverwinter, sometimes all I would do was log in, press a button, receive a reward, and then log back out. The longer my streak of logging in every day, the greater the rewards I could obtain. Contrast that with what occurred in the Phoebe release on Tuesday. CCP removed the 24-hour limit on the skills queue. That's right, CCP now believes they receive more of a benefit from not forcing players to log in frequently to update their skills queue. So who's right? Possibly both. Aion and Neverwinter are both free-to-play games, which depend on their cash shops. Those games need players to log in to have the opportunity to entice them into buying the latest shiny. EVE, on the other hand, is a subscription game, and allowing players to only train skills with out logging in gives CCP as much money as if they play 3 hours a day. However, I think CCP will act as an outlier in the future as more game companies will become desperate for players to simply log into its games. Daily quests are bad enough, but at least people are playing the game. Getting rewards for just logging in? Been there, done it, didn't like it. I've never participated in one of the Blog Banters before, but the current subject is one I occasionally write about. Up until May 2012, CCP released monthly subscription figures to the now-defunct MMOData, so anyone wanting to keep track of the health of EVE could just visit that site. But since then, trying to figure out how EVE Online is doing is like reading tea leaves. No one outside of CCP, except maybe the CSM, really knows, although all indications are that the game has lost players over the past year. EVE Online has run for over 11 years and any decline in player numbers should surprise no one. But EVE players are shocked and alarmed. 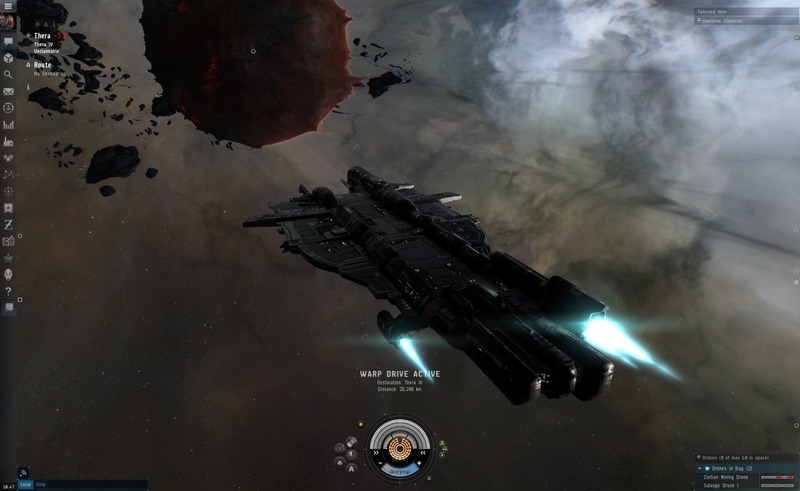 Much like World of Warcraft, EVE Online is an anomaly in the MMORPG industry. Except instead of posting Blizzard's huge numbers of subscriptions, CCP managed to make a game that grew in numbers for the first ten years of its existence. I honestly don't think that will ever happen again, at least in my lifetime. So what is success if I expect declining player numbers will naturally decline in a game this old? I think if CCP is able to have the same number of players in June 2017 as EVE had in June 2014, then the efforts of CCP Seagull will have succeeded. But how do we measure success if we do not have subscription numbers. Personally, I will look at three areas: financial, technical, and player activity. In the financial area, the obvious measure is looking at CCP's periodic financial statements. A player always manages to get the information and post the reports on the internet. But I will also look at a different measure. Did CCP have to lay people off. If CCP does not have to have another round of layoffs, then things are going well. I should probably qualify that as layoffs outside of China. I don't know what will happen with DUST 514, but any layoffs associated with the sunsetting of that game should not count against EVE. In the technical area, I look at two areas. First, will Tranquility support EVE game play without the servers either crashing or displaying the "soul crushing lag" message? Probably not, but if in three years the game supports 3,000 man fleet fights without reaching 10% time dilation, I'll consider that a win. Look for the implementation of "Brain-in-a-Box" and any new server hardware purchases for progress in this area. The second area is if CCP is able to maintain its aggressive release schedule. Watching CCP Seagull's keynote presentation at EVE Vegas, I think she was pretty pissed off that people don't think that CCP can maintain that schedule. If CCP can maintain that 10 releases a year schedule with good quality updates, that will help the marketing efforts. Currently, video game players are paying for season passes to get all of the downloadable content for single-player an co-op games. That isn't much different than what CCP is charging. If an EVE subscription is viewed by potential players as paying for a service, then that helps CCP financially. Finally, player activity. 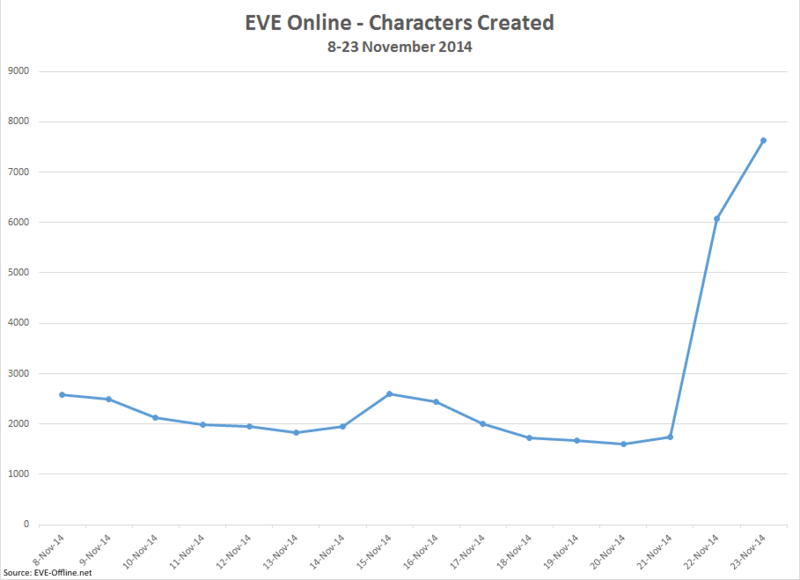 Yes, with no subscription numbers to look at, the all-time Average Concurrent User graph on Eve-Offline.net is still an important indicator of the health of the game. But I also will look at the player activity as shown by Dotlan as well. Ships exploding is not only a sign of player activity, but helps drive the economy. The more ships exploding, the more business for industrialists, thus making that type of game play thrive as well. The last metric I will use is the PLEX market. Not necessarily the price of a PLEX, but the volume of trade as well. While not a great indicator of player activity due to the actions of speculators, the volume can tell a tale, especially in tough economic times in real world. If in June 2017, all of these indicators are at June 2014 levels, then I'll consider that a success. Now, some may consider my criteria for success rather modest. I'd disagree. If in June 2017, a 14-year old game is still a top 10 game in the Western MMORPG market, then I think anyone from the outside looking in would consider that a rousing success. The rankings of the top twelve MMORPGs as determined by the players of the Xfire community from play on Sunday, 2 November 2014. For more details about the methodology, click here. Historical data can be found here. This weekend saw the Xfire community's interest in the most popular MMORPGs inch up once again. Sunday's 1.8% increase in the number of hours that Xfire members spent logged into these games was led by Runescape (+226 hours), while World of Warcraft (-354 hours) led all games that experienced a decline. Neverwinter returned to the list after a three week absence, replacing RIFT. A Double XP Weekend - Runescape witnessed a big spike on Sunday on the strength of a double XP weekend. The double XP offer was only available to paying customers, however, as free players only received a 20% boost. Another Halloween Event - Neverwinter jumped back into The Digital Dozen after a three week absence based on its holiday event, Masquerade of Liars. The event only ran from 30 October to 3 November and offered two daily quests as well as rewards from the cash shop. The Patch - Final Fantasy XIV saw another healthy increase in the number of hours Xfire members spent logged into the game. In addition to patch 2.4 which introduced the rogue and ninja last Tuesday, Square Enix also held a fan festival in London on Tuesday and Wednesday. Over the past two Sundays, the amount of time the Xfire community has played FFXIV increased by 52.8%. "If I am a high sec CEO, my optimum path is to be non social. It is to not invite people to help me run missions." The CSM 9 Summer Summit minutes are out and some people are really upset. Chief among them is DJ FunkyBacon, who let loose with an epic rant on his EVE Radio show on Friday night/Saturday morning and followed up with a post on his blog yesterday. What has the Gallente factional warfare alliance leader so upset? A proposed change to the aggression mechanics that would have CONCORD swoop down on anyone who shoots a corpmate.